This project was so much more than just a gatefold brochure! 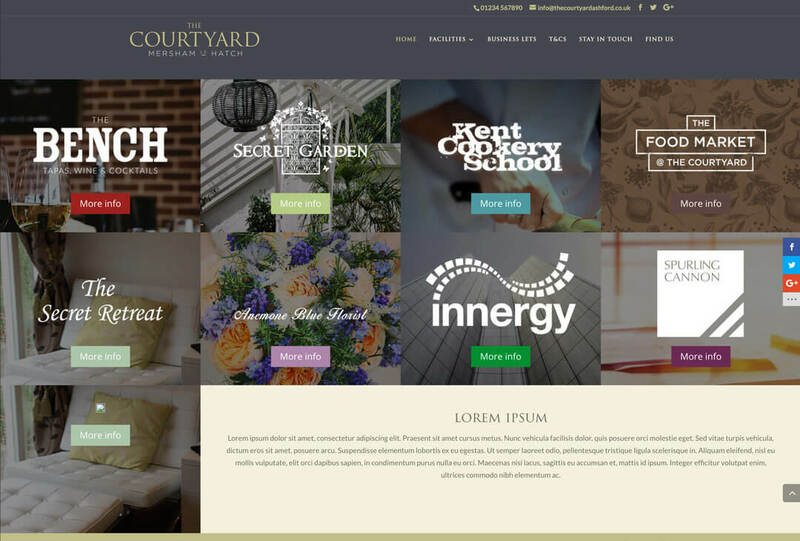 Mersham Le Hatch business park was rebranding as ‘The Courtyard’ with the intention to become a local produce, local services shopping and dining destination. The 18th century stable buildings set in the grounds of Mersham Le Hatch near Ashford in Kent, was already an established business park housing a florists, restaurants, architects, and a wellbeing centre. 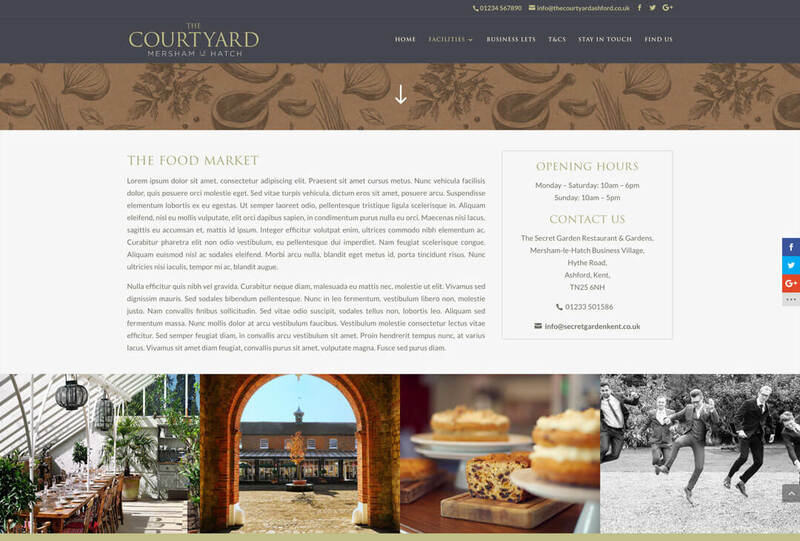 Having recently refurbished a number of retail units in the converted stables, the business park was to be rebranded as ‘The Courtyard’ with the new purpose of becoming a destination location for local artisan foods and crafts. One of the larger units was being converted to accommodate a permanent ‘Food Market’, which would be home to a butchers, bakers, craft sellers and a cafe style dining area inside and outside in the original courtyard. Proactive were commissioned to create the new brand. We made a site visit to Mersham Le Hatch to capture some of the ambience of the elegant settings. The park is currently home to a prestigious restaurant and high-end wedding venue set in an exquisitely manicured, walled country garden. Set in the centre of the stable block is a dominating clock tower which was chosen to be the focal point of the new branding. 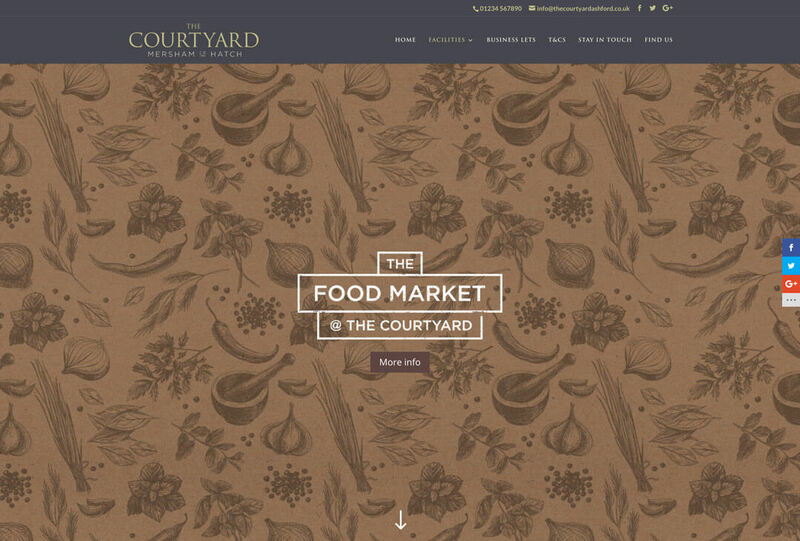 The Food Market was never intentionally required to be branded, but the client had seen one of the concepts we had produced for the The Courtyard and decided that that would work well. As part of the branding project we created a website for the business park with individual pages for each of the existing businesses and included the new ‘Food Market’ offering. We wanted to use an illustrative approach to the branding of the Food Market and chose a rustic style, brown paper look and feel, evoking images of traditional bakers and butchers and specifically the way they might have wrapped food in times past. 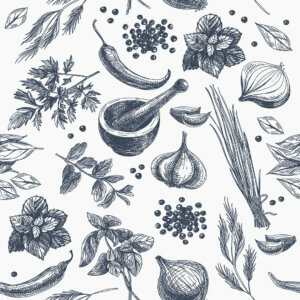 We found some hand-drawn images which really captured the idea of the traditional, artisan feel we were trying to convey. 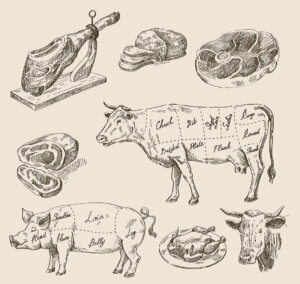 Traditional herbs and plants combined with illustrations of butchery and meat cuts seemed ideally placed to visually describe the idea of the ‘Artisan’. This project is a brilliant example of how Proactive work best. We love getting stuck into an idea and seeing it through to completion. This project included branding, website design, brochure design and finished with gatefold brochure printing. A great project to work on with a really fantastic final result.